Foodjam at Trio Nov. 16th Special Event! 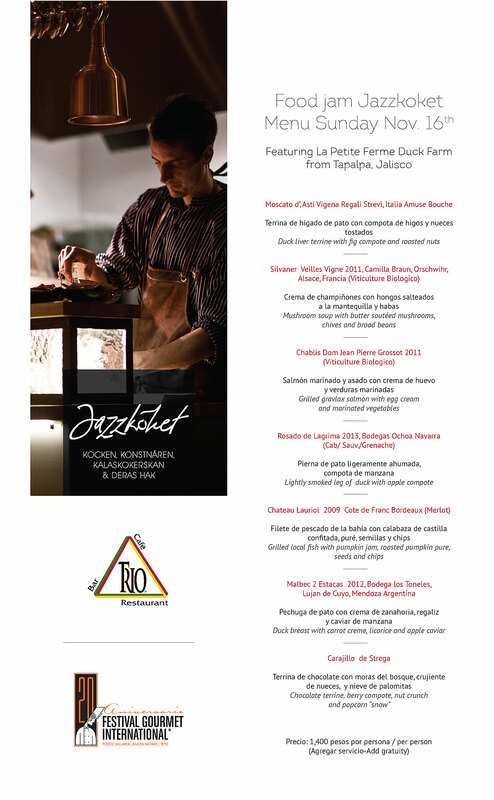 Enjoy a special Food & Wine Dinner on Nov. 16th at Trio! Improvisation of a meal where focus lies on the overall results is what they call Foodjam, Jazzkökets cutting edge product. Every time a creative person with fruitful thoughts about food. This could be a food producer, farmer, chef, baker, food artisan, author, artist or musician with the chefs, a one off menu is created. The guests are all treated to the same gastronomic show. The dishes are complemented by a carefully selected menu combined with wines. Local duck enthusiast & producer La Petite Ferme from Tapalpa, Jalisco invited. Do not miss this once in a lifetime special event!